Why Choose a Dual Console? Versatility for one. 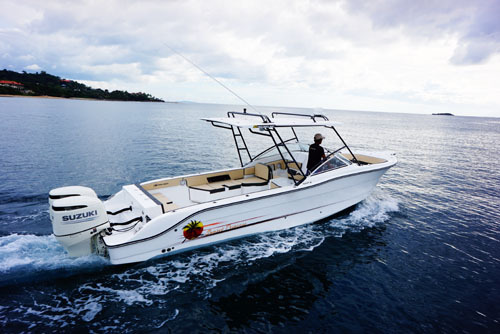 A dual console offers many options while out on the water. A wide open rear cockpit offers exceptional fishing room. The forward bow seating is perfect for chatting it up with friends and enjoying the view whilst cruising. The large swim platform offers a place to gear up or chill after a dip in the ocean. Go Wakeboarding, pull tow toys or go water skiing all this the DC does really well. Now how about its offshore ability? 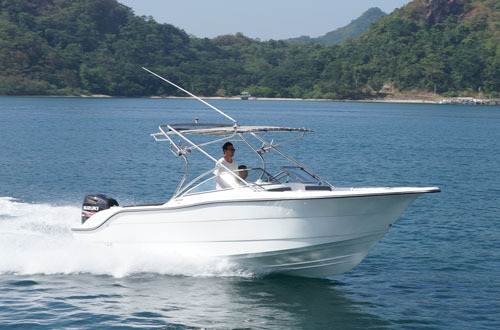 Self Bailing Decks ensure safety at sea while its large bow flare keeps the ocean out of the boat in rough conditions. They may be laid out like a Bow Rider but thats about it a Bow Rider is for a lake and a Dual Console is for the Ocean!